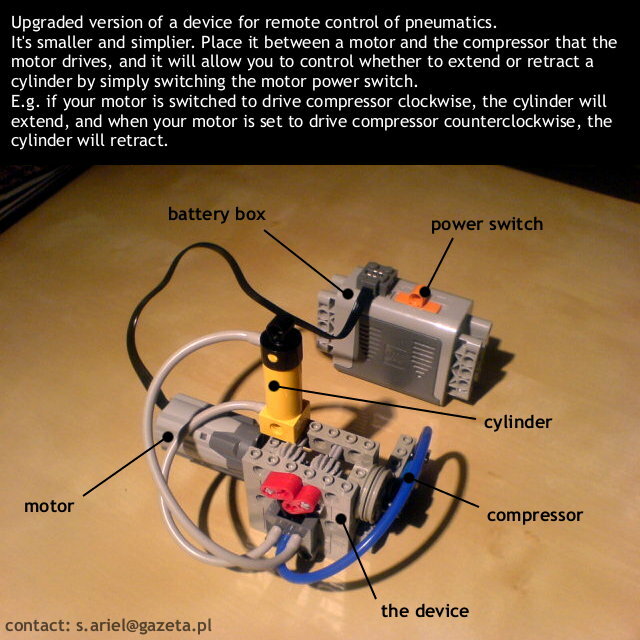 Electrical control of Pneumatic Valves, is one of my favorite subjects! After a first design presentation and introduction to this theme, I'd like to show some other great designs that solve the same problem in several different ways. The coolest one IMHO, is another design from Paul (Sariel). It combines pneumatic valve electrical control with a compressor in one single design and also uses a PF motor. It features a compact and very efficient design, where a pair of small pushers control the pneumatic valve sticker. Very cool solution, indeed! Motor running direction allows to control both extension and retraction movements of a pneumatic cylinder, by making use of LEGO worm screw sliding properties. Single device can just control a single valve. But the valve can be connected to any number of cylinders (either in phase or in opposition combinations). See it in action at the video below, and take a look into the respective Brickshelf folder for a detailed understanding of working principles. This is a magnificent and compact solution for such applications with one or few independent sets of pneumatic movements, where space is not very limited. The fact that each set requires its own pneumatic pump (compressor) and motor may turn into a limitation when space is a problem. Also this is not the first attempt from Paul to solve the problem. See his former solution video below and again, the respective Brickshelf folder. Below, I will shortly present a few other Micro-motor Actuated Pneumatic Switches. 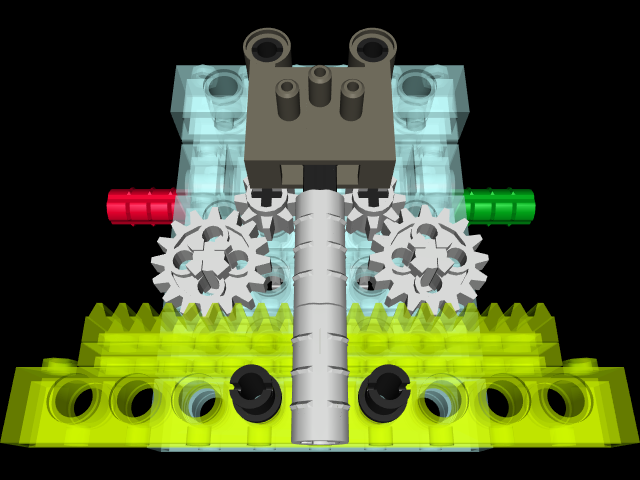 The main resume can be found at CSSOH's LEGO Pneumatic Page, where Linc , Brian  and Ben  models are compared for they strengths and weaknesses (some even don't work properly...). Realize that Ben's version looks to be the same as in the TBs first presentation referred at this post beginning. And to close, another design by my co-blogger Alexandre (AVCampos), who made its own exercise to control multiple pneumatic switches, with one single motor. Smart design too! Remember to see it before, but didn't took the attention it deserves. I just built Paul's second mechanism, with the sliding worm gear. Very cool idea.